Today we are going to talk about making money by flipping clothing. That is to say, buying clothing for cheap and reselling it for...well... as much as you can get for it. Flipping is not for everyone, but it's an awesome way to supplement your income. Say you want to take an expensive vacation, have disposable income for large purchases, or are unable to work in a traditional environment, flipping could be the perfect solution. This is part one of a four part series, and we're going to discuss where to source for your product. It's important to do research beforehand, so stay tuned for part two: what to buy. First things first, you need to decide what type of clothing you are going to flip, and this is going to determine a few things: where you sell, how you sell, and how much inventory you can find. If you are overwhelmed by the idea of going into a thrift store or bargain store and flipping through the racks for hours, you will need to focus your search. I say start selling what you know: If you are a fashionable woman, do women's clothing. If you wear nothing but yoga pants but your kids are dressed to the nines, do children's clothing. If you're a dapper male or a working gent, stick to menswear. From there, you can narrow your field further: perhaps you only want to sell women's vintage clothing, or kid's vintage, or men's quality workwear. Niche market items may be harder to find, but they also sell for more. On the other hand, the harder items are to find and the more difficult it is to locate buyers, the less you sell. The most obvious place to search for things to resell is a thrift store. The racks are usually somewhat organized, and there is a minimal amount of work required in finding "good stuff." There is a common consensus that small mom and pop thrift stores, especially charity based ones, are the best. That is because they don't sort through their inventory and sell things online like places such as Goodwill. The potential to find a Chanel jacket is there at the mom and pop. Always try to go on sale days...for example my Goodwill has $1 days on Sun/Mon when a certain tag color is $1. And my Salvation Army has half off tags every Wednesday. Find out when your sale days are and go on those days. Next up is thrift store outlets, or by the pound places. These places are dirty, and there is a lot of digging, but there's also a lot of money to be made. I am lucky enough to have one by my house so I go somewhat regularly. From one of my trips, about 2 hours of digging, I spent $27 and sold my items for $239. I still have a few left from that trip, but most sold. There are lots of resources out there about how to approach these places, and I recommend doing a little reading before you go. Garage sales are a great place to find quality modern clothing for a good price. You want to pay $2 or less per piece, ideally closer to $1. Look for multi-family or community yard sales. Don't be afraid to bundle lots of items together and negotiate the price. Estate Sales are goldmines for vintage items, but you have to put effort into checking the sales before you go. Look for estate sales on Craigslist and EstateSales.Net . Particularly, look for keywords and look in all the pictures they have posted. Look for closets in the background. Often they think purses and scarves are coveted items and they lay them out on the bed, but don't forget to look in the background of these photos. There are lots of other resources for estate sale shopping but one thing I will say is: Go early and prioritize the best sales. Consignment Stores can be a good place to buy if you find out their sale days. Look for higher end items or quick flip items (items that are guaranteed to sell quickly). Places like Plato's Closet will often have 90% off or $1 sales - go on those days. Facebook Groups are another good place to get deals. Look for consignment stores that are closing, people who just cleaned out their closet and want to sell an entire bag of clothing for $20, etc. Skip the folks itemizing and selling their stuff one by one, you want to buy a bundle of clothing, not pieces. Next up is online shops. This is a great resource if you're home bound. My favorite is Schoola (If you use this link to sign up you get $10 referral credit on your first order). The normal prices are high, but if you wait until they have sales you can get killer bargains. The search is hard to use, but just search a brand you want to sell and see what comes up. Always spend over $30 to get free shipping. Once they had a $1 cardigan sale, and I bought 30 cardigans and within days had already made my money back, plus some. By the time they all sell, I expect to make close to $300. Another online shop is ThredUp (again, use this link to get $10 referral credit). Their prices are high, but you get a discount on your first order that makes it worthwhile. Make sure to load up your cart and spend as much as possible! I think their limit for the first order is up to $50 in discounts. Search google for the best discount codes, or use an online plugin like Honey. You can also buy from Goodwill online. Beware of shipping costs which are often calculated after purchase. This is the stuff Goodwill pulls from their donations to sell at a higher price, which I find annoying but oh well. No one is asking me. I once bought a gorgeous Mexican tooled handbag from Goodwill online and won it for around $10 but shipping ended up being $15. So not a bad resource but use with caution. And of course you can buy lots and bundles from Ebay as well. 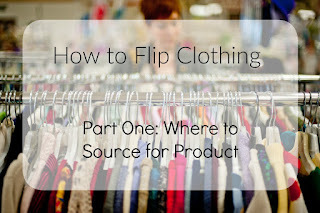 Many flippers also buy NEW items from places like Nordstrom Rack, Bargain Hunt, and Marshalls/TJ Maxx. Because these items have extended return policies, aside from shelling out the cash up front, if the item does not sell it is no harm, no foul, because you can simply return it. Go during clearance events for the best bargains. Sign up for email newsletters to get information about sales. The last place I recommend sourcing materials, is your own closet or your friend's closets. If you or your friends are donating items, better to try and sell them! Let your family know that you would be happy to take their (free) quality clothing, and see what gets dropped on your doorstep. Well, I hope this has been helpful for all of you potential resellers! Remember to tune in for part two which is more information on what to buy. Other topics will include where to sell, and the logistics of selling. Leave me some comments, questions or feedback! Experienced sellers, do you have any tips for some people just starting out?